RING Ivy Topiary. Let soil approach dryness between watering. Do not let roots sit in water. Exposure: Bright, indirect light., Indoor Temp: 40 - 80 degrees F, Weight: 1 lb, Pot Size: 4.25 inches, Height: 12 inches. This ivy topiary comes in a plastic pot with no additional decor. Clay pot or mylar wrapping available for additional charge. Ring ivy live topiary plants are simply among the most visually impressive fresh topiary displays around. They are large, they have an unusual shape for a plant, and their owners often like to bedazzle them with ribbons and baubles to make it even more over the top. Now, that style might not appeal to everyone, but it is certainly true that a fresh topiary wreath like this ring ivy can be the centerpiece of a seasonal party any time of the year, which is sure to catch the attention of any guests, friends, or family who happen to come over to visit. Don't be afraid to get wild with these live topiary plants, because they are your opportunity to do so. 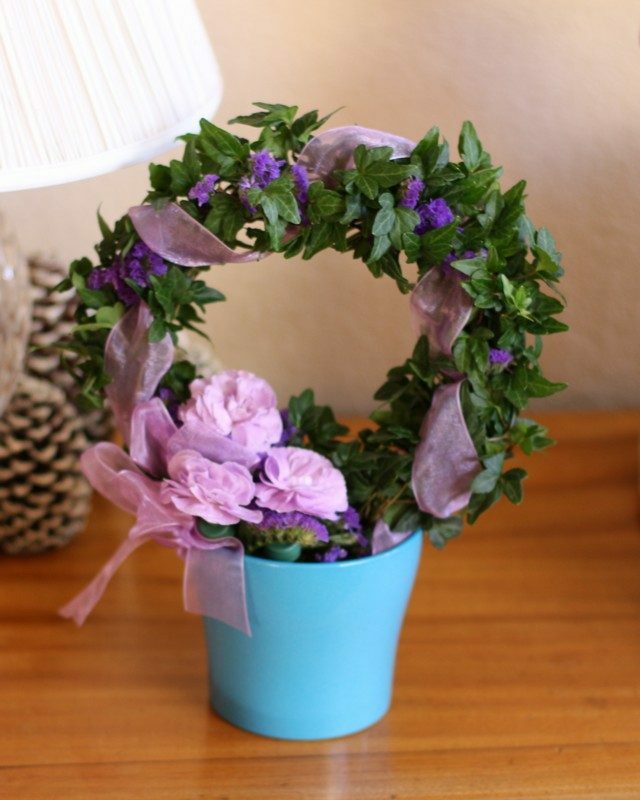 Wreaths are known to be decorated and as such, adding a couple ribbons and the like would be a perfect edition to the plant, making them stand out even more than they already do. Other kinds of topiary tend to be laid-back and subdued. On the other hand, wreaths are the wild side of topiary: experiment with them. Bring out the colored ribbons, string, and other adornments, and just see where the mood takes you. It is a whole new approach to topiary. Topiary are not usually decorated, but the wreaths are. It is difficult to hang these plants because of their shape, but that is just as well, because they are at their best when they are at eye level. After all, it will be at eye level where most guests, family, and friends will be able to easily spot them to get a conversation about them going! This ring ivy topiary makes a great gift for a loved one - decorate it to add a personal touch!